What Do Spurgeon & Stanley Have in Common? 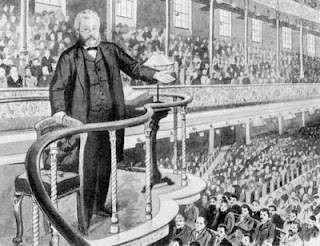 If you spend any time around people who define themselves as part of the "reformed" stream of Christian faith, then you'll probably sense an admiration for Charles Spurgeon (d. 1892) and a not-so-favorable opinion of Andy Stanley. That's not always the case, but I have found to be true in almost 100 conversations now. Of course, there are several points of contention between those who lean toward Spurgeon and those who lean toward Stanley. Based on their doctrinal systems, the two sides will always have quibbles about soteriology (thoughts about salvation), ecclesiology (thoughts about the church), and eschatology (thoughts about the end). "While I'm a firm believer that all Scripture is equally inspired, observation tells me that all Scripture is not equally applicable" (Communicating for a Change, 96). And the reformed guys (who pride themselves on verse-by-verse expository preaching) get all up in arms: "How dare you disregard Scripture! Haven't you read 2 Timothy 3:16-17?" Settle down guys. I'm sure Andy has read those verses. "Although all Scripture is good and profitable, it is not all equally appropriate for every occasion" (Lectures to My Students, 81). Did you hear that? They said the same thing. And still I've seen Spurgeon praised in the exact same blog posts that take issue with Stanley's statement! 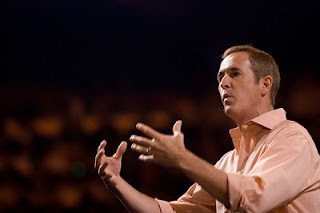 Andy Stanley: "Preaching for life change involves picking those passages that are more appropriate for and applicable to our target audience" (page 96). Charles Spurgeon: "Among many gems we have to select the jewel most appropriate for the setting of the occasion" (page 82). They both believe that the selection of biblical text(s) is very important. And that every text, though equally inspired, is not equally applicable or appropriate for every occasion. Say something memorable this Sunday. Good Comparison! You have highlighted the good points that are in common.